Il arrive toujours! Marcel Duchamp, chess player and artist just won't go away, and now a sumptuous new book1 about him is available, reviewed in New in Chess2 no less. Duchamp lived his art, but according to analysis by art critic Francis M. Naumann, his life had another organising theme: he played it like a game of chess. But what is this! Oh no! He's Set The Board Up Rong! And him a Proper Chess Player, too. So, if it was not the photographer what switched it, then maybe Duchamp did, single handed and deliberately - a little joke, as Hans Ree implies. Well, unlike Successful Man and his Dame in the ad, we are not amused, especially as Marcel also messed up the disposition of the Pieces, and lost a black Pawn from a7. It might be witty to STBUR, but it is sloppy to STPUR as well. 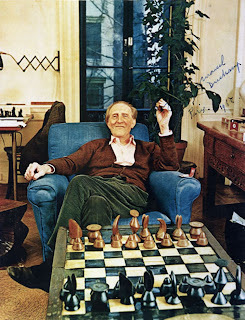 The nub of Francis Naumann's article is that you can read Duchamp's life story as a game of chess, with an opening, middle game, and end-game. Well maybe, and maybe not. Starting to do it, doing it, finishing doing it, is a bit of a universal, Duchamp, Uncle Tom Cobleigh and All included. But there is more to it according to Naumann. At some time in his life, though "exactly when...it is difficult to know for certain", Duchamp "realized that the game of chess could serve as a model for the decisions made in his both his life and art". His adversary was the "entire history of western art"4. So his life didn't just look like a chess game, he played it like one as well. My problem with this is: how is anyone supposed to use chess as a model for dealing with life's dilemmas, and furthermore should they try it at home? Will the voice in your head whisper: "If you do this, and life does that, then what the heck will you do next, matey?" 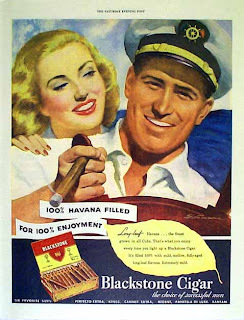 Or, more to the point these days, "Will you get your moves in before your flag falls?" Or what, exactly, and actually? We appear to have another example of False Metaphor Syndrome implying that if some activity or other, life even, can be executed with rational planning, strategic oversight and finely tuned risk assessment it is like chess. The trouble is (a) life is only a bit like that (slings and arrows etc) and (b) however hard we try, chess is only a bit like it as well. While I don't go for the Duchamp's life=chess theory, there is something that Mr Naumann overlooks that might help his case, ranking with the fork, gambit, trap etc episodes that he identifies in Duchamp's chess-themed biography. In the last twenty, yes twenty, years of his life Duchamp worked secretly, yes secretly, on the "Etant donnés", a rather shocking piece that maybe only his last wife Teeny Matisse (yes, "Matisse", she was once married to his son) knew about. "Etant donnés" was revealed after his death in 1968. Now, if you are really going for chess analogies then that's what I'd call a humdinger of a sealed move (and that's this blog's second, and last, modest contribution to Duchamp scholarship). Then there's the matter of the Riddle of Duchamp endgame position which he set in 1943, and which has now been analysed to a draw. 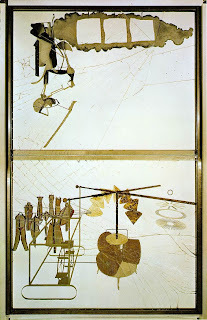 Duchamp declared it "White to play and win". The Naumann view, which Hans Ree appears to accept, is that in spite of his designation Duchamp already knew the position was drawn and was just being a lovable rogue pretending otherwise, the fig-leaf of justification for this ruse being his sense of entrapment because his new love was already married to another. You can hear almost them tut-tutting "Duchamp du chump". And me leathering my Occam's Razor. It's simple; he genuinely, and inadvertently, misanalysed the ending. He thought it was a win for white and was just wrong. End of. 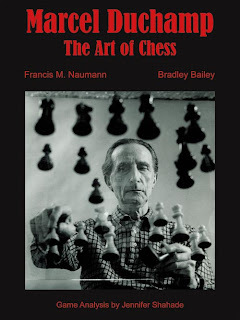 Part two of the book, Bradley Bailey's essay "Passionate Pastimes: Duchamp, Chess and the Large Glass", also demonstrates impressive research and scholarship, and marshals an encyclopaedia of information of interest for any unredeemable Duchampaphile. However, it is his conclusions that will raise an eyebrow and Ree complains that he embraces "the Freudian arsenal of calumny wholeheartedly". Hans is not amused. Bailey method is to unearth multiple chessic references in Duchamp's work – not just the early paintings where he depicts chess players at play, plain for all to see, but in the later constructions where, allegedly, they are hidden and have to be prised out. Bailey's principal focus is the "Large Glass". on two glass panels. 109 1/4" x 69 1/4". Or you may not; but Mr. Bailey's analysis is that the Large Glass is chess-rich, and further, the bachelors stand for none other than Monsieur D. himself; all of them and all at once. The catalogue of allusions goes from the superficial, for example, the line between the two domains mimics the fold in many travelling chess sets (it looks more like the half-way line on a soccer pitch to me) via the conceptual, so you have "to operate the mechanism in the mind's eye", which makes it like chess (or, one might add, like an instruction manual or flow chart); to the historical e.g. the nine bachelors are based on chessmen (say some), but could more likely be middle-aged, 13th Century, pawns. There is more, but let's stop here. Attention, bachelors at work in 1914/1915. The claim that the bachelors (to whom Duchamp, in his notes, gives male uniformed roles such as bellboy, priest, gendarme) are pawns is based on parallels that Bailey sees with Jacobus de Cessolis' treatise on chess from 1275 or thereabouts6, and associated illustrations. This was written as moral instruction for the peasantry, and gave the individual pawns model characters and socially useful trades (smiths, weavers, etc.). If he knew about it, such sermonising may not have appealed to Duchamp's anti-clericalism, which counts against Bailey's conjecture, but on the other hand Duchamp liked a nice uniform, and had been a student of the language of clothing since his youth. Fascinating, and perhaps as Hans Ree somewhat grudgingly puts it "far from being uninteresting". However, that voice in my head asks "where's the smoking gun?" 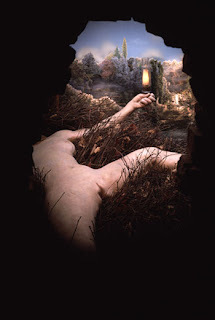 Is there any concrete evidence that Duchamp studied de Cessolis, and his later interlocutors? Bailey looks a bit thin and circumstantial on this point, which to my pedantic empiricist cast of mind is critical. It makes a poor comparison with say Ray Keene's discovery of Duchamp's study notes on Nimzovitch's Chess Praxis7. And another thing: there are nine bachelors but most chess sets have only eight pawns. To support the claim that all nine of them represent a kind of Duchamp-composite we are asked to accept the breathtaking assertion of the great anthropologist Claude Levi-Strauss that in economic status the difference between a bachelor (Duchamp's existential status) and his hapless married comrades is that the former "must have a greater variety of clothes". Delivered with a straight face. You must be joking. We are not amused. But, as Ree says of Naumann's chess-was-literally-his-life theory, it makes a good story. Part three of the book is fifteen of Duchamp's games annotated by Jennifer Shahade. They give the flavour of his strength and style about which there has been much debate, with our own Ray Keene entering the fray, but that's for another time. The notes provide a good text based narrative of the games and chess ideas for the unchessed reader, with only one minor infelicity. In Duchamp's eye-catching game against E. H. Smith in 1928 the commentary describes his offer of R for B as "sacking the exchange"8. It looks like the editors' spellchecker has done its worst, but that extra 'k' delivers a subtle chessic double entendre; Marcel might have been amused. Notwithstanding my doubts, the book is a fascinating chronicle of Duchamp, the chess playing artist, or artful chess player. Beautifully produced, it sits well in the hand like a nice felted and weighted chess piece. Hans Ree's review also does it, and Marcel Duchamp, proud offering perceptive insights and anecdotes of his own. Hans Ree finishes by applauding Duchamp's personal and humane qualities. He was "quiet, meticulous, ironic, aloof...not the values of our brutal time". Let's acknowledge also the good work he did in his later years, documented by Mr. Naumann, supporting and raising money for chess and chess education in the USA. 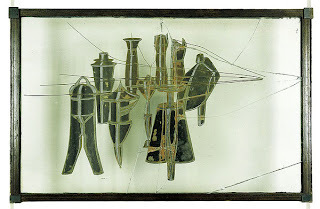 Mr. Naumann does the memory of Duchamp a great service by bringing this to our attention. Thanks Francis Naumann; and good on you Marcel. 1 Marcel Duchamp: The Art of Chess. Francis M. Naumann and Bradley Bailey. readymade press, New York 2009. 2 "There is no solution, because there is no problem". Hans Ree, New in Chess 2009/5. 3 Also in the book, but at the end and without the autograph. 4 Naumann, op. cit., page 2. 5 Slightly edited from a quote in Marcel Duchamp, Dawn Ades, Neil Cox and David Hopkins. Thames and Hudson 1999. Page 106. 6 The Book of Chess, Jacob de Cessolis. Translated (and edited) HL Williams. Italica Press, 2008. 7 Naumann, op. cit., page 25. 8 Naumann, op. cit., page 109. As far as I'm concerned - I do it very occasionally, and I'm a good deal younger than Marcel was at the time. I suppose it's just possible that the photo was reversed, and that even the items carrying writing has been produced specially, reversed, so that they would come out right in the shot. But I very much doubt it. Another one to add to my "after dissertation" list Martin. Hope to hand it in Monday so rest of the week should be filled with Chess in art.